Robert Texeira was fishing with his friends Keoni, Rex and Kahana on the Ka'u Coast of the Big Island in June of 2005 when he took a powerful strike on one of his custom-made 13-foot Talon CY026 rods. His Newell 550 reel's ratchet screamed and it was game on! The 104-lb giant trevally had taken a tako bait on a size 52 Tankichi hook and even though it severely tested Robert's 80-lb test Maxima Ultra Green line, the big fish still lost the battle. 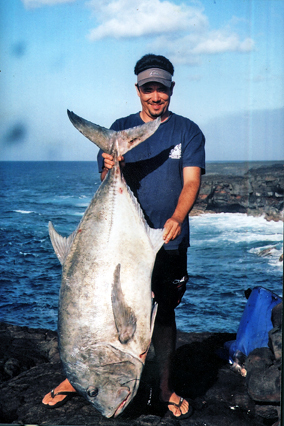 This is Robert's third 100-plus-lb ulua!